Vegetable oil refinery means removal of gums, waxes, phosphatides and free fatty acid (F. F.A.) from vegtable plant; to impart uniform color by removal of coloring pigments and to get rid of unpleasant smell from the oil by removal of odiferous matter. 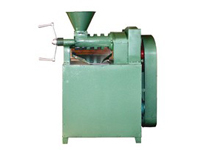 Usually, vegetable oil refinery is carried out either on batch operation or as continuous operation. With certain oils even physical refining can be carried out instead of chemical. 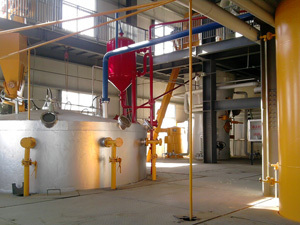 Vegetable oil can be used as feedstock for an oil refinery. There it can be transformed into fuel by hydrocracking (which breaks big molecules into smaller ones using hydrogen) or hydrogenation (which adds hydrogen to molecules). These methods can produce gasoline, diesel, and propane. For refining the oil, there are three basic processes in vegetable oil refinery. First process is neutralizing, the oil in the neutralizer to remove the Free Fatty Acids (FFA) by adding caustic soda. Neutralized oil is drawn into the second vessel called bleacher where colour of oil is removed by bleaching process with aid of chemicals such as carbon black and bleaching earth. Bleached oil then goes to the plate filter press where bleaching earth and chemicals are separated and clean bleached oil is then drawn to deodourizer where oil is heated above 110°C through thermic fluid coils and then live steam is given to the oil from the bottom steam nozzles and temperature of oil is raised upto 200 to 220°C through thermic fluid coils. Entire process is done under high vacuum. Note: We accept enquiries in English, Español (Spanish), Русский язык (Russian), Français (French) and العربية (Arabic). Our professional team will reply to you within one business day. 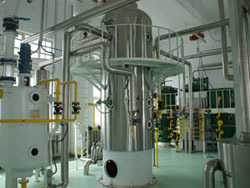 Please feel free to contact us to get more info about vegetable oil refinery!